You'll need the d3Gas library. Unlike Excel and VBA, you can't get at worksheet functions from Apps Script. However D3.js has some useful functions that operate on arrays just like some of the Sheets built in functions. To demonstrate I've implemented a few below. Where my input sheet looks like this. 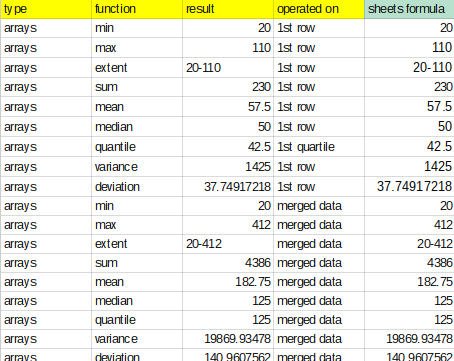 And the results are this - the final column is the result using the built in worksheets to see that they match the d3 generated results in the 'result' column. D3 has d3.quantile() where you can specify any quantile between 0 and 1, so d3.quantile(values,0.25) should be equivalent to =QUARTILE(range,1) but I'm not getting consistent results from it - I don't know why yet - there are multiple ways of calculating a quantile so i need to look at this some more, but the other formulas work perfectly.